Emperor of France, born in Ajaccio (Corsica) in 1769 and died in St. Helena on May 5, 1821. Which were to become emperor of the French between 1804 and 1815, was revealed to be one of the most brilliant military of all time and a statesman whose influence on the European continent determined profound changes that gave rise to the contemporary age. Napoleon was the son of Carlo Buonaparte (later francized name until like Bonaparte) and Letinia Ramolino. With the support of the French Governor on the island, he/she studied at the College of Autun, and later, thanks to a scholarship granted by Luis XVI, joined the school military de Brienne, to continue his education at the military school in Paris. In 1785, he/she finished his studies of military, reaching the rank of Lieutenant and standing at the head of a regiment of artillery. Subsequent years were spent in provinces (Valence and Auxonne) fittings, taking advantage of its time to expand its military readiness (delved into his studies of mathematics, artillery and tactical military), come into knowledge of the classical political thinkers (especially Machiavelli and Montesquieu) and discover his passion for history (dazzled you the biographies of Alejandro, César and especially that of Federico II). The melancholy felt by the long absence of its native island was becoming sympathies by the Corsican separatist movement, then led by Paoli. The French revolution began in 1789, was the great springboard for the ascent of Napoleon. When it exploded he/she moved to Corsica, actively participating in political struggles, so it reached the rank of Lieutenant Colonel; but his confrontation with Paoli, who was wary of the ambition of the young military, and especially the breakdown of the independence movement with the Convention and its call to the English to get the French withdrawal, made that Napoleon and his family had to flee (June, 1793). These developments aroused the patriotic pride in the military and did, rather than the previous preparation, a real French nationalist. Appointed commander, took over the artillery of the army of Dugommier, being determining their performance for the reconquest of Toulon (December, 1793), which earned him the promotion to general. At that time it began its direct relationship with political leaders of the revolution; support given Robespierre happened your Bill this fall, however bars claimed their participation, ordering him the Suppression of the realistic uprising of October 1795. His performance earned him the appointment of Commander of the army of the interior, managing the Suppression of subversive activities, especially against the Jacobin club. Meant the culmination of his promotion his marriage to Joséphine de Beauharnais, one of the figures of the influential salons of Paris in the revolution. In March 1797 he/she received command of the French army in Italy, where a showdown against Austria; was carried out the peninsula was the scene of the first manifestations of the great military genius of Napoleon. The victories of Lodi, Arcole, Rivoli forced Austria to sign the Treaty of Campoflorido. Fearful politicians from the directory of the Napoleonic ascension, approved its project to strike at the heart of the English route to the East; eager to emulate the greats of the past, Napoleon led his expedition against Egypt: he/she occupied Malta and Alexandria (June, 1798) and definitely defeated the Mamluks in the battle of the pyramids. But the Admiral Nelson managed to destroy his fleet, what you to prisoner of his triumph and incomunicaba him with France. He/She carried out a brilliant policy of public works and archaeological excavations (origin of the European passion for Egypt), attacked the Turks in Syria and was on the verge of conquering San Juan de Acre. But knowing the French difficulties in the continent, left Egypt breaking the English siege. In Paris and named Commander of the troops in the capital, Napoleon contemplated the great unpopularity of the directory; which facilitated the preparation and the triumph of the coup d'etat that took place on 18 Brumaire (November, 1799). Was a people Republic whose Executive was in the hands of a triumvirate (Bonaparte, Sieyès, and Ducos ); but, as first Consul, Napoleon ended up cornering power and founding a military dictatorship which lasted fifteen years. The Consulate was extraordinary: it ended the civil wars which ravaged the French West, reorganized the Administration and endowed the State of so-called new institutions to have a force that reaches the present (Council of State, judicial organization, Governors, legislative codes), favored the resurgence of religious life and made church a faithful collaborator of his work (Concordat of 1801) and opened a financial administration that ended the previous chronic deficit. Abroad, he/she faced the second Coalition, which defeated in the battles of Marengo and Hohenlinden (June and December 1800), reaching the peace of Luneville with Austria and the peace of Amiens with Great Britain, affected in their trade by the campaigns and committed to restore the French colonies that had occupied. 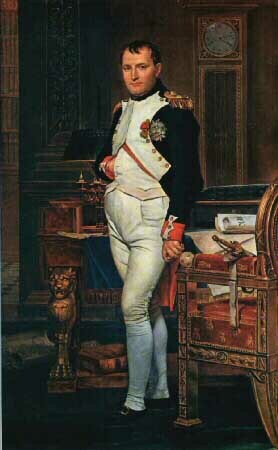 The popularity that they offered him peace inside and outside allowed Bonaparte to debug the triumvirate, submit to the institutions and adopting the Constitution of the year X (August, 1802) who appointed him Consul for life, allowing you to choose his successor, which meant the monarchical restoration indeed. English mistrust before Napoleonic expansionist plans rekindled the war; In addition to launch a programme of colonial expansion (Santo Domingo, Louisiana, India), in the Centre of Europe, Napoleon protecting a constitutional rearrangement for their benefit (was appointed President of the Italian Republic, reorganizer of Germany, guardian of the Swiss Confederation). London prompted several plots that failed, allowing the persecution of opponents of the Consul, who ended up getting the accession of former revolutionaries. This was used by Napoleon to establish a hereditary military monarchy and proclaim himself emperor, being crowned by the Pope in Notre Dame, in December 1804. The regime introduced by Napoleon took some revolutionary reminiscences and some external signs of the Republic, but, essentially, claimed to be a traditional monarchy, with his court and an imperial nobility. The Empire was a continuation of the modernisation undertaken during the Consulate; the codification work was synthesized in the Napoleonic code (1804) and the Imperial catechism (1806); new curricula were developed, and established new centers of education (institutes and universities, 1806); the policy emphasizes customs reform, the promotion of new crops (notably beets), support to incipient industrialization and the opening of major public works (redevelopment of Paris); censorship saved every hint of criticism to the imperial regime (laws of press and printing); at the time that meant the arts with the intention of making them cultural agents of the regime. The development of this imperial policy entailed enormous costs, which could hardly be covered with new fiscal policy and the return of excise; the demographic strength of France and the richness of its production were the basic stands of the regime. The third great support was the army; both the Consulate and the Empire had a basically military philosophy; However the army was not in good condition; his administration lacked the essential, there was no equipment, there were serious failures in health care and pay the soldiers usually missed. To minimize these shortcomings, Napoleon conducted intense propaganda, both on the population and especially in the soldiery, whose components were fanatical, blind faith in the Napoleonic direction. And the military genius of Napoleon really shone during the Empire; It revolutionized the strategic concept and laid the foundations of what would become the military art until the beginning of the 20th century. The three basic principles of his military philosophy rested on the power, security and the economy of forces; its manifestation was in the possession of the initiative; the search for strategic goal decisive, without losing energies in great manoeuvres of distraction; great importance of the secret service, both in the front and in the rear of the enemy; control of communications lines, hampering progress and removed from the opponent; reorganisation of the composition of armies, with differentiation and specialization of the different bodies; massive use of artillery in battle and the cavalry for the persecution of the adversary. Starting from 1805 Napoleon held an unbroken series of wars against the coaligadas against powers. His goal was to extend the French territory up to the Rhine, surrounding the Empire in a series of State Allied satellites, some of which were ruled by her relatives. In 1805-1806 Napoleon captured his interest in Italy and Germany, defeating Austria and its allies in Ulm and Austerlitz, and Prussia at Jena and Auerstedt; victories led Napoleon to launch the initiative of Continental against Great Britain (November, 1806), blocking in order to ruin its economy; 1807-1809 were the years of encroachment: creation of the Federation of the Rhin, annexation of Etruria and the Papal States, conquest of Portugal, invasion of Spain and dismemberment of Prussia. In 1810 Napoleon was at the peak of his power; except for Spain, his mastery of the vassals of the Mainland States was absolute, while the effort to maintain control was extraordinary. Eager to ensure his dynastic Empire, Napoleon disowned Josefina and married María Luisa, Archduchess of Austria, who finally had a son (March, 1811), Napoleón II. However, the latent difficulties were considerable: the increase of the tax burden and indirect taxes, the reiteration of camshaft, internment of Pius VII, strict censorship, police actions and relentless opposition persecution increased unrest in the vassal States and in particular in France. The need for funds was that it would reinforce the continental blockade; to ensure it was annexed to the Netherlands and the German coast. But he/she was wary of the Russian attitude, so with the Alliance of Austria and Prussia, in June 1812 Napoleon invaded Russia at the head of an army of 600,000 men. The Russian army practiced the scorched earth, so despite reaching Moscow, Napoleon's army could not stay or equip the field. The withdrawal had dramatic consequences; While the rearguard was constantly attacked by the Russians, the successive alliances were becoming enemies to the former allies. In the middle of 1813 the Napoleonic Empire was surrounded by enemies in war. The Grand Allied Coalition took back the French armies, while betrayal of the marshals, occurred the nobles came in contact with the allies and the people ignored the so-called desperate to Napoleon to defend the homeland. In April 1814, Napoleon must admit the Treaty of Fontainebleau, which abdicated the throne; He/She continued to maintain his title of Emperor and granted him a pension and the Government of the island of Elba. His captivity lasted a year; While the allied powers at the Congress of Vienna decided to deport him away from Europe (although there were assassination plans) and in France the return of the Bourbons returning to raise counter movements, Napoleon secretly left the island, and landed in France. With its only prestige, without firing a single shot, Napoleon recaptured France; This flight of the Eagle gave rise to the Empire of the hundred days. With his army of Veterans faced the powerful allied armies led by Wellington and Blücher, who ended up imposing in Waterloo (June, 1815). 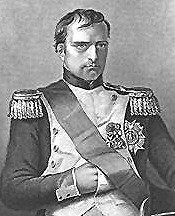 Not be able to flee to United States Napoleon surrendered to the British, being confined in Saint Helena until his death. Napoleon in his study by Jacques Louis David (oil on canvas, 1812). National Gallery of art (Washington). Even in life and at the time that they were forgetting worst dyes of its authoritarianism, the figure of Napoleon was entering the legend. Its rapid rise, extraordinary adventures and his tragic end made the archetype of the romantic character. The son of the revolution, as he/she liked to be called, though he/she repudiated his performances the same principles, extended to all of Europe their ideological bases. With the "return of the ashes" in 1840 to disabled persons, the figure of Napoleon received the definitive popular support and its historic consecration. CRISCUOLO, V.: Napoleon. Madrid, Alianza, 2000. FIERRO, A.; PALLUER GUILLARD, A.; TULARD, j.: Historie diccionnaire du Consulat et l´Empire. Paris, Robert Laffont, 1995. THOMPSON, J.M. : Napoleon Bonaparte. Oxford, Blackwell, 1990. LATREILLE, a.: L´ere napoleonean. Paris, Armand Colin, 1994. WOOF, Stuart: The Napoleonic Europe. Barcelona, critique, 1992.